Welcome to the world of machine learning with scikit-learn. Machine learning can be overwhelming at times and this is partly due to a large number of tools that are available on the market. This post will simplify this process of tool selection down to one – scikit-learn. In this Series, you will learn how to construct an end-to-end machine learning pipeline using some of the most popular algorithms that are widely used in industry and professional competitions, such as Kaggle. Algorithms that you will learn to implement scikit-learn in series. Now, let's begin this fun journey into the world of machine learning with scikit-learn! 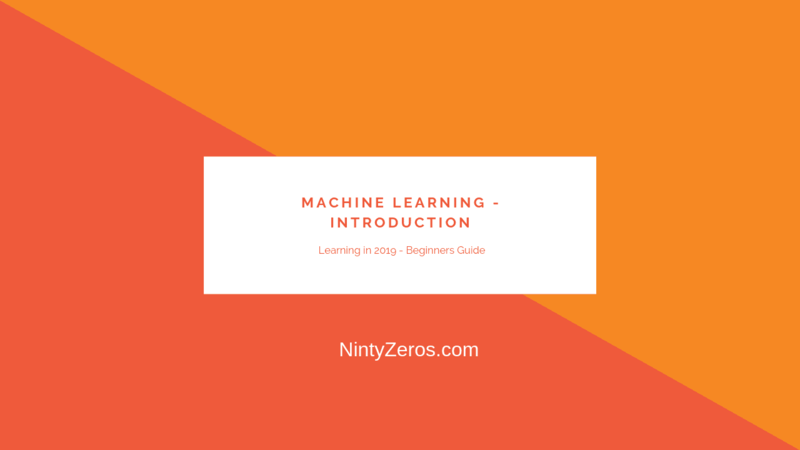 A brief introduction to machine learning! So, what exactly is machine learning? Simply put, machine learning is a set of methods that can detect patterns in data and use those patterns to make future predictions. Machine learning has found immense value in a wide range of industries, ranging from finance to healthcare. This translates to a higher requirement of talent with the skill capital in the field of machine learning. Supervised learning is a form of machine learning in which our data comes with a set of labels or a target variable that is numeric. These labels/categories usually belong to one feature/attribute, which is commonly known as the target variable. For instance, each row of your data could either belong to the category of Healthy or Not Healthy. Given a set of features such as weight, blood sugar levels, and age, we can use the supervised machine learning algorithm to predict whether the person is healthy or not. Although supervised machine learning is the most common type of machine learning that is implemented with scikit-learn and in the industry, most datasets typically do not come with predefined labels. Unsupervised learning algorithms are first used to cluster data without labels into distinct groups to which we can then assign labels. This is discussed in detail in the following section. Unsupervised learning is a form of machine learning in which the algorithm tries to detect/find patterns in data that do not have an outcome/target variable. In other words, we do not have data that comes with pre-existing labels. Thus, the algorithm will typically use a metric such as distance to group data together depending on how close they are to each other. As discussed in the previous section, most of the data that you will encounter in the real world will not come with a set of predefined labels and, as such, will only have a set of input features without a target attribute. Given this data, our objective is to create groups that could potentially be labeled as Healthy or Not Healthy. The unsupervised learning algorithm will use a metric such as distance in order to identify how close a set of points are to each other and how far apart two such groups are. k-means: The k-means algorithm is a popular algorithm that is typically used to segment customers into unique categories based on a variety of features, such as their spending habits. This algorithm is also used to segment houses into categories based on their features, such as price and area. Reinforcement learning is an area of Machine Learning. Reinforcement. It is about taking suitable action to maximize reward in a particular situation. It is employed by various software and machines to find the best possible behavior or path it should take in a specific situation. Reinforcement learning differs from the supervised learning in a way that in supervised learning the training data has the answer key with it so the model is trained with the correct answer itself whereas in reinforcement learning, there is no answer but the reinforcement agent decides what to do to perform the given task. In the absence of training dataset, it is bound to learn from its experience. How we are going to do it? Scikit-learn is a free and open source software that helps you tackle supervised and unsupervised machine learning problems. The software is built entirely in Python and utilizes some of the most popular libraries that Python has to offer, namely NumPy and SciPy. The main reason why scikit-learn is very popular stems from the fact that most of the world's most popular machine learning algorithms can be implemented quite quickly in a plug and play format once you know what the core pipeline is like. Another reason is that popular algorithms for classification such as logistic regression and support vector machines are written in Cython. Cython is used to give these algorithms C-like performance and thus makes the use of scikit-learn quite efficient in the process. Scikit-learn is designed to tackle problems pertaining to supervised and unsupervised learning only and does not support reinforcement learning at present. The pip method can be implemented on the macOS/Linux Terminal or the Windows PowerShell, while the Anaconda method will work with the Anaconda prompt. of you who are just beginning your journey into the world of machine learning. and how you can go about installing the necessary software. Now, we'll put this into practice💪 and do some data exploration and analysis. The dataset we'll look at in this section is the so-called Boston housing dataset. (TSV), SQL tables, and JSON data structures. Indeed, Pandas has support for all of these. is available directly through scikit-learn. In machine learning, the variable that is being modeled is called the target variable; it's what you are trying to predict given the features. For this dataset, the suggested target is MEDV, the median house value in 1,000s of dollars. Here, we introduce a dummy variable y to hold a copy of the target column before removing it from the DataFrame. We then use the Pandas concatenation function to combine it with the remaining DataFrame along the 1st axis (as opposed to the 0th axis, which combines rows). For this dataset, we see there are no NaNs, which means we have no immediate work to do in cleaning the data and can move on. To simplify the analysis, the final thing we'll do before exploration is remove some of the columns. We won't bother looking at these, and instead focus on the remainder in more detail. Since this is an entirely new dataset that we've never seen before, the first goal here is to understand the data. We've already seen the textual description of the data, which is important for qualitative understanding. We'll now compute a quantitative description. This computes various properties including the mean, standard deviation, minimum, and maximum for each column. This table gives a high-level idea of how everything is distributed. Note that we have taken the transform of the result by adding a .T to the output; this swaps the rows and columns. We call sns.heatmap and pass the pairwise correlation matrix as input. We use a custom color palette here to override the Seaborn default. This resulting table shows the correlation score between each set of values. Large positive scores indicate a strong positive (that is, in the same direction) correlation. As expected, we see maximum values of 1 on the diagonal. Here, n is the number of samples, xi and yi are the individual samples being summed over, and Xbar and Ybar are the means of each set. We can see that it presents us with a regression problem where we predict a continuous target variable given a set of features. In particular, we'll be predicting the median house value (MEDV). We'll train models that take only one feature as input to make this prediction. This way, the models will be conceptually simple to understand and we can focus more on the technical details of the scikit-learn API. This error metric can be converted to an average error in dollars by taking the square root. Doing this for the polynomial model, we find the average error for the median house value is only $5,300. This completes the extensive guide to understanding how to write your first Machine learning model. Here, we used visual assists such as scatter plots, to deepen our understanding of the data. We also performed simple predictive modeling. In the next part, we will look into what is MSE/RMSE and work with more other models to enhance accuracy. Hope you liked it! Please Share this guide to other fellow readers. Can you post how to read different plot and identify? Good Post ! very lengthy though! I am newbie to machine learning and looking forward to learn~!